Over medium head, saute your onions in a tablespoon of oil until entirely soft. Remove from heat and set aside for later. Mix all your ingredients together in a mixing bowl. You can mix them together with a spoon, but I tend to use my hands as I think the mix gets coated better that way. (Obviously, wash your hands first...and after!) This is where I'd grab a tiny 'taste test' to make sure I feel my seasonings are up to par; adjust as necessary. Place this whole mixture in a resealable container (tupperware, etc.) and let it sit in your refrigerator about 5 hours. Make sure to keep it covered when in use, and refrigerated when not. Your salad will stay fresh for a little over 24 hours. 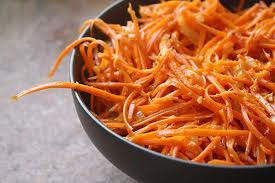 Slice carrots into long, thin strips. Then mix your carrots, salt and sugar together then set aside for 20-30 minutes. Press mixture firmly and drain any liquid. You'll then preheat your oil to 200°F (95°C) and carefully pour over the carrots. Finally, add the vinegar, soy sauce, coriander, garlic and pepper, mixing gently but thoroughly. Refrigerate for 3-5 hours before serving.